If you can look past the clunky design of the web site, Re-Mix is a great site serving up classic vintage style shoes from the 20's - 40's (Thanks Olivia and Dolin!). I am in love with the 40's style wedges, especially "Gloria" with the big o' bow (which is removable). Not only that, the shoes are new and affordable too! I love this color Avocado/Honey. Perfect for spring! The Fashion Show pics are up! As I try to gather my thoughts to do a proper write up and review for MAKE as well as express my thoughts here, I thought I'd first share the photos (since they are public on my Flickr). There were lots of people involved and I want to make sure I get every detail correct as well as tell the story of all the crazy incidents and funny happenings that make a fashion show. It's been a whirlwind week and I'm slowly trying to recover (was a little bit sick). So in reality this may not happen till early next week. Most of all thanks to Diana Eng and Emily Albinski for their wonderful talent and our new friendship! Black Box Nation is ready for launch soon! 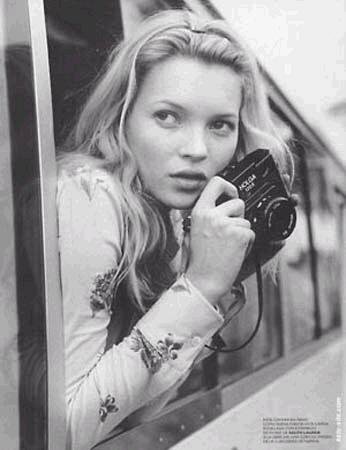 So maybe it was kismet that I had the photo of Kate Moss with an old school camera before I took off for the Maker Faire last Friday. Kate Moss is now one of the faces of the digital world as the new spokesperson for Nikon's new digi-camera, Coolpix S6 (read the USA Today article). I like the combination of high fashion and technology and I want us to see more, more, more of it! Give me Christy Turlington for Nokia and Giselle Bundchen for Flickr!! You can find out more about this campaign when it launches May 8th at stunningnikon.com. I'm off to the Maker Faire for set up and fashion show rehersals. I hope to see you all! I'll have tons of photos when I'm back. Have a great weekend everyone! 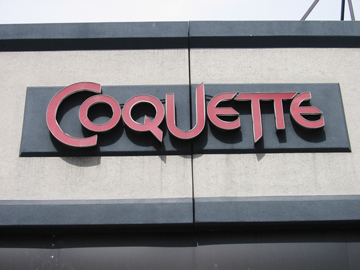 My friend Daniel (the other half to my favorite crafty gal Chrissa) took this shot for me of an empty shop called "Coquette" in Cambridge, MA right near Central Square T stop. Apparently, it was a campaign headquarters for a few months and now is just empty. Too bad I don't live near there, otherwise I'd feel compelled to open up a crafts studio or cute boutique! Thanks Daniel! 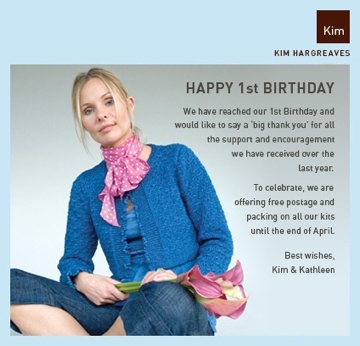 Happy 1st Birthday Kim Hargreaves! I am sure many of you know my love for the work of knit designer, Kim Hargreaves. She worked for Rowan for years and years, and ventured off into her own business just one year ago. This morning, I got the above image in my email inbox. I immediately thought to myself, "oh wow, how cool free shipping! But can't this be true for little o' me all the way over here in California?" So I decided to reply back to the ad email and ask if this applied to me. Just to see if I'd get a response. To my surprise, within 1 minute, Kim wrote me back and said, "Yes of course, it's for all our customers. Thank you for your loyalty we really do appreciate it, if there is anything else you need please do get back to us." WOW! I was just too excited by it all! Ok now that's some classy service. But Kim and Kathleen are all class and style. You can tell from the site and the beauty of the work, their love of the craft. I loved how the last time I bought this crochet beret, Gem (from a post I did last December), I got an email a couple weeks later asking me if I received my package and if everything was ok. So nice! Not to mention last summer as I was working on my Joy sweater and had problems visualizing the pattern detail on the image, I emailed customer service about my problem, and the next day I got an email from Kim sending me a higher res photo and a pattern grid to help me. So I plan on ordering something and I've narrowed down a few key spring selections that I think are perfect projects that I can finish this spring and wear it in time for summer. A cute tie front shrug with the most delicate button sleeve detail. I can imagine many a fun summer parties wearing this. I'm thinking to make this in Bloom (deep red). 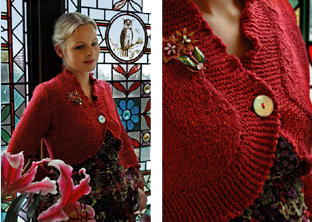 A close fitting shrug with 3/4 sleeves finished off with a shell button in the center. This looks like a nice quick project. I love the split neckline and it is too cute paired here with a scarf. It also looks simple enough to make quickly. Perfect for taking to the beach for a nice cover up too. Now this one looks like a fun project. Can't drink a glass of wine and work on this one! ; ) It is so beautiful it puts me in an English countryside mood. I loooove the detail and the buttons closures in front. Thank you Kim and Kathleen Hargreaves for such beautiful knitting kits! Here's to many more birthdays to come! I got a chance to interview my fellow fashion blogger, Andrea Tung of Making Things for the Make Blog. Andrea is such an inspiration and I am so supportive of her yarn business and of course her love of DIY and knitting! 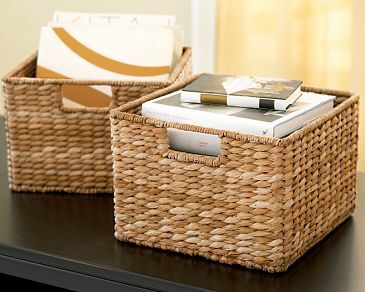 I got tired of having stacks of magazines on the floor or slopping off my bookshelf so I got two of these handy Savannah Baskets ($29) for my bookcase. Two was my limit. I knew if I got more, my bookcase would start looking like Pier 1 Imports. 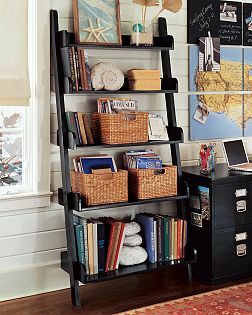 Our bookcase looks like this (kinda sorta), but is taller and not from PB. It spans our concrete wall with 4 bookshelves. And they are all full. So I have no idea how somebody would be wasting space with a big o' shell, starfishes in a big frame, and huge rocks on their prime bookshelf real estate. The fake leaves in the vase of sand at the top shelf is also a bad accident waiting to happen. Anyway... I also got 2 smaller baskets that come with lids, for my craft/sewing area to hold all the little things I keep collecting (aka buying) more and more of. It's definitely much cleaner but now the little boxes are filled to the brim. I'm very happy with the baskets but I need more ideas for storage (for knick-nacks)... and I'm thinking something in color next. Then I saw this on Just My Cup of Tea today! 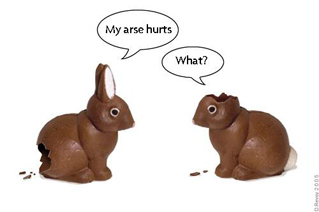 Wow these lil' chocolate bunnies get around. 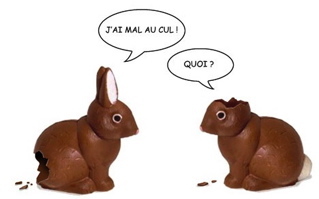 If anyone sees more of these 2 bunnies speaking another language let me know! They do seem to find their way around the Internet. From the London Underground Blog. So its been raining non-stop in San Francisco it seems for months now. My little umbrella finally took the brunt of it last Friday in a heavy downpour and massive wind (where I got drenched) so I decided it was high time to get a new one. 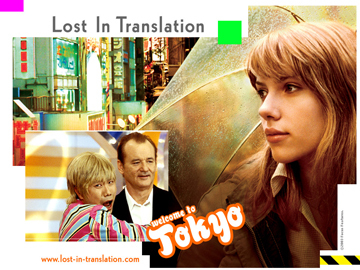 I always wanted Scarlett Johansen's clear umbrella from the movie "Lost in Translation". 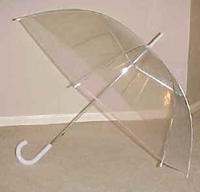 I did a search on Google and found this place, Giftwagon, that sells the same umbrella for only $12.95. I didn't want the 60's bubble one. This one looks like the same one Scarlett has! Just watch, by the time I get this in the mail the rain will finally stop!!! Of course, that is fine by me because I would gladly save this fashionable rain accessory for next season, just to see and be able to feel the freaking sun again.